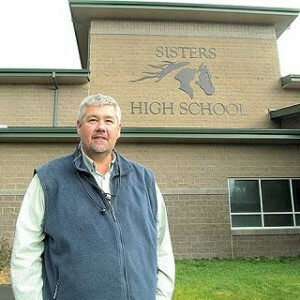 The man who is overseeing Sisters School District’s bond measure projects has deep roots in Sisters and Central Oregon. Project Manager Brett Hudson and his wife, Cara, moved to Sisters in 1997, and their two children went from kindergarten through graduation in the District. The couple still lives in Sisters and remains active in school activities, including helping operate concession stands at Outlaws athletic contests. They also were founding members of the Outlaw Booster Club, and he is president of the organization. He was born in Portland, but grew up in Bend and Redmond, graduating from Redmond High School. Cara, too, grew up in Central Oregon. Now Hudson is bringing his background in development to the job of making sure capital projects funded by the bond proceeds in an efficient, cost-effective way. His role is to serve as the school district’s liaison to the architects as well as electrical, plumbing, and other personnel. The District advertised for a project manager after the $10.7 million bond passed last spring. Hudson, 48, was selected and is classified as a District employee through the anticipated end of renovation and construction in August 2018. That classification means he receives medical insurance from the District in addition to his salary. His base salary is $81,000, said Jayel Hayden, regional human relations director for the High Desert Education Service District, which contracts with Sisters School District. The project manager job was advertised on the E.S.D. website and the Oregon School Board Association website from July 6 through July 20, he said. Hudson was hired August 1 after recommendation by Superintendent Curt Scholl and an affirmative vote of the Sisters School Board. Hudson served as project manager to design golf courses and resorts for the window-manufacturing firm Jeldwen until 2008, when the economy stalled and resorts and golf courses weren’t a priority. He managed bond projects for Redmond, Crook County, and Culver school districts from 2009 until 2015, with some of that work still ongoing. He also orchestrated the Redmond City Hall renovation, and is overseeing the renovation of the McClay Building into a performing arts center for Redmond Proficiency Academy. “I’ve been able to get all that experience with other companies and bring it back home,” Hudson said. The next step in the bond program is to hire an architect. The district issued a request for proposals and received applications from four firms, Hudson said. The winning company will be named during the Wednesday, November 2 school board meeting. After that, a bidding process for a general contractor and sub-contractors will begin. “Most likely there will be multiple general contractors,” Hudson said. School officials want to design a roadmap for the bond work, determining the order in which different projects will be tackled. Hudson, the design committee (composed of District employees), the architects (when the firm is hired), and members of the bond facilities oversight committee will meet together to determine that roadmap. He noted that the oversight committee, consisting of community members, is charged with ensuring that the design of bond work is true to the intent of the bond. “You want a good consensus group that pulls everything together,” he said of the group approach. The bond includes money for Americans with Disabilities Act barrier removal at every District building. In addition, all three schools’ administrative offices will be redesigned for better visibility and safety. Hudson is anticipating the coming months as Sisters School District takes the steps authorized by voters.